"Kara Walker (American, b. 1969) is best known for her room-size tableaux of black cut-paper silhouettes that examine the underbelly of America's racial and gender tensions. Her works often address such highly charged themes as power, repression,history, race, and sexuality. Focusing on painting and printmaking in college, she received her BFA from the Atlanta College of Art in 1991 and her MFA from the Rhode Island School of Design in 1994. Her work has been exhibited nationally and internationally and is included in the collections of major museums worldwide. The 2007 Walker Art Center–organized exhibition Kara Walker: My Complement, My Oppressor, My Enemy, My Love is the artist's first full-scale U.S. museum survey. Walker currently lives in New York, where she is a professor of visual arts in the MFA program at Columbia University." Text and photo from walkerart.org. View her work here. "Mequitta received her MFA from UIC in 2003, mentored by Kerry James Marshall. Her work has been exhibited across the U.S as well as in Paris, Brussels, Berlin, India and Dubai. In February, 2010, Mequitta was profiled as an “Artist to Watch” in ArtNews. Holland Cotter, art critic of the New York Times, in his 'last chance' article on June 1, 2007, sighting Mequitta’s NY debut exhibition Encounters, stated 'Referring to the artist’s African-American and East Indian background, the pictures turn marginality into a regal condition.'" Text and photo from automythography.com. View her work here. "Painter, printmaker, and weaver Emma Amos was born in 1938 and grew up in Atlanta, Georgia, where her parents owned a drugstore. She began painting and drawing when she was six. At age sixteen, after attending segregated public schools in Atlanta, she entered the five-year program at Antioch University in Yellow Springs, Ohio. She spent her fourth year abroad at the London Central School of Art, studying printmaking, painting, and weaving. After receiving a BA from Antioch, she returned to the Central School to earn a diploma in etching in 1959. Amos’s work has been exhibited internationally and is included in the collections of the Museum of Modern Art, the Wadsworth Atheneum, the New Jersey and Minnesota state museums, and the Dade County and Newark museums. She has won prestigious awards and grants." Text and photo from emmaamos.com. View her work here. "Weems is an art-photographer, performance artist, activist and videographer—well known for her photographic series and multi-screen projections relating to themes focusing on family, beauty and memory. For the last 25 years, she has relied on stories from the ‘kitchen table’ and of life in the low country of South Carolina, antebellum New Orleans, cities in Senegal, Cuba, Ghana and Italy to create a body of work that engages in history. An artist concerned with iconography, she has constructed a series of works questioning black women’s presence in popular and material culture as well as art history. Throughout her 30-odd year career, Weems has re-staged historical moments and created images that re-imagined everyday life from family stories to political history. Weems focused her camera on her own body to create multiple conversations. She interrogates and assembles old stereotypes and disassembles them." Text from lightbox.time.com. Photo from New York Times. View her work here. "Lorna Simpson was born in 1960 in Brooklyn, New York, and received her BFA in Photography from the School of Visual Arts, New York, and her MFA from the University of California, San Diego. When Simpson emerged from the graduate program at San Diego in 1985, she was already considered a pioneer of conceptual photography. Feeling a strong need to re-examine and re-define photographic practice for contemporary relevance, Simpson was producing work that engaged the conceptual vocabulary of the time by creating exquisitely crafted documents that are as clean and spare as the closed, cyclic systems of meaning they produce. Her initial body of work alone helped to incite a significant shift in the view of the photographic art’s transience and malleability." Text from lsimpsonstudio.com. Photo from thesaudavoice.com. View her work here. "Wangechi Mutu observes: 'Females carry the marks, language and nuances of their culture more than the male. Anything that is desired or despised is always placed on the female body.' Piecing together magazine imagery with painted surfaces and found materials, Mutu’s collages explore the split nature of cultural identity, referencing colonial history, fashion and contemporary African politics. In Adult Female Sexual Organs, Mutu uses a Victorian medical diagram as a base: an archetype of biased anthropology and sexual repression. The head is a caricatured mask – made of packing tape, its material makes reference to bandages, migration, and cheap ‘quick-fix’ solutions. Mutu portrays the inner and outer ideals of self with physical attributes clipped from lifestyle magazines: the woman’s face being a racial distortion, her mind occupied by a prototypical white model. Drawing from the aesthetics of traditional African crafts, Mutu engages in her own form of story telling; her works document the contemporary myth-making of endangered cultural heritage." Text from Saatchi Gallery. Photo from annansi.com. View her work here. "New York-based artist Mickalene Thomas, best known for her elaborate paintings, introduces a complex vision of what it means to be a woman. Her mixed media works, comprised of rhinestones, acrylic, and enamel, stem from her study of art history and the classical genres of landscape, portraiture, and still life. Inspired by a number of sources, including Matisse, Manet, Bearden, and the 19th Century Hudson River School, she expands the common definitions of beauty, infusing pop art and popular culture, exploring notions of beauty from a contemporary perspective. Mickalene is represented by Lehmann Maupin in New York City, and Susanne Vielmetter Los Angeles Projects." Text and photo from mickalenethomas.com. View her work here. "From the start of her career, Ms. Gallagher has made paintings with lines or grids that she decorates and sometimes overruns with repeating images that refer to racial stereotypes: black-faced comedians, afros, lips, nurses and wigs. The grids recall the work of Minimalist painters like Agnes Martin, and the copied images recall Pop Art, particularly Andy Warhol. Far from being preachy or regretful, her work is a meditation on 20th-century black culture, an attempt to remember the good and the bad by resuscitating images. 'I'm interested in reactivating something that was static,' Ms. Gallagher said. 'I find that so much more interesting than critique.'" Text and photo from The New York Times. View her work here. 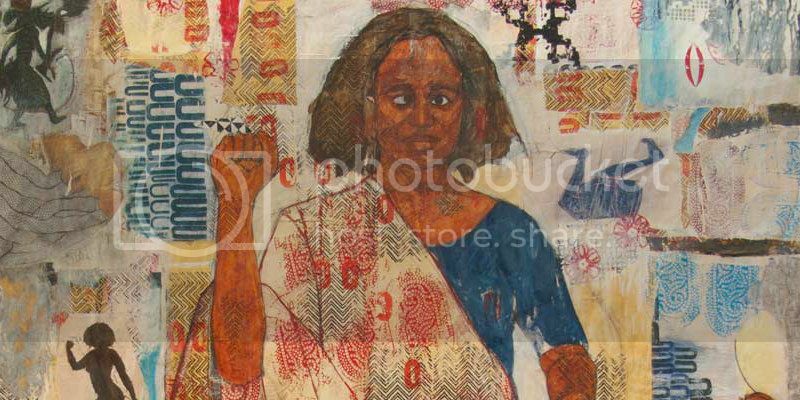 "Amaki’s art captures the lives of African women of the Diaspora through media from everyday life (photography, quilts, buttons, boxes and household items). Her work redefines the lives of past and present African American heroines and heroes and contrasts their depiction in the mainstream media. Amaki holds memberships in the College of Art Association, American Association of University Professors, Emory University Alumni Board of Governors, Delaware Center for the Contemporary Arts, High Museum of Art, Georgia Museum of Art, and Spelman College Museum of Fine Arts. Her solo works, Amalia Amaki: Boxes, Buttons and Blues have also been on exhibition at the National Museum of Women in the Arts, Washington, D.C." Text from The History Makers. Photo from blackartdepot.com. View her work here. "Joyce J. Scott (b. 1948) is a versatile artist from Baltimore, Maryland. She is a printmaker, weaver, sculptor, performance artist, and educator, but she is probably most well known for her work in jewelry, beadwork, and glass. Her art, in whatever form, reflects her take on all aspects of American popular culture, her ancestry, and the immediate world of her neighborhood. Her pieces serve as a commentary for issues regarding race, politics, sexism, and stereotypes. Of her own work, Scott has said, "I believe in messing with stereotypes...It's important for me to use art in a manner that incites people to look and then carry something home - even if it's subliminal..." She received her B.F.A. from the Maryland Institute College of Art and M.F.A. from the Instituto Allende. Her work is in the collection of the Baltimore Museum of Art, Mint Museum, Spencer Museum of Art, and the Smithsonian American Art Museum." Text from Craft in America. Photo from bsgw.org. View her work here. "The work of Alison Saar addresses humanity in the broadest sense. Through the use of archetypal images, Saar reaches out to audiences from backgrounds as culturally and ethnically diverse as her own. Her mother, well-known artist Betye Saar, has European, Native American, and African American ancestors; her father, Richard Saar, painter turned conservator, is of German and Scottish origin. Fragments of lore, myth and legend as well as the practices of the everyday, rooted in these cultural backgrounds, are woven into Saar's powerful images, where contemporary expression enshrines centuries of man's spiritual evolution." Text from phylliskindgallery.com. Photo from lalouver.com. View her work here. "Faith Ringgold, painter, writer, speaker, mixed media sculptor and performance artist lives and works in Englewood, New Jersey. Ms Ringgold is professor emeritus at the University of California, San Diego where she taught art from 1987 until 2002. Professor Ringgold is the recipient of more than 75 awards including 22 Honorary Doctor of Fine Arts Degrees. Ringgold’s art has been exhibited in museums and galleries in the USA, Canada, Europe, Asia, South America, the Middle East, and Africa. Her art is included in many private and public art collections including The Metropolitan Museum of Art, The National Museum of American Art, The Museum of Modern Art, The Solomon R. Guggenheim Museum, The Boston Museum of Fine Art, The Chase Manhattan Bank Collection, The Baltimore Museum, Williams College Museum of Art, The High Museum of Fine Art, The Newark Museum, The Phillip Morris Collection, The St. Louis Art Museum and The Spencer Museum." Text and photo from faithringgold.com. View her work here. "Throughout her career, Catlett has been a political progressive committed to improving the lives of African-American and Mexican women, and she has often used her art explicitly to advance their cause. She has also protested, picketed, and even been arrested in her quest to win justice for those she describes as "my people." Moving from the United States to Mexico in 1946, she was eventually identified as an "undesirable alien" by the U.S. State Department. For nearly a decade she was barred from visiting the United States. Despite these struggles, Catlett's art reveals no trace of bitterness or despair. Indeed, she has remained true to the universal, life-affirming themes that first animated her sculpture in the 1940s'the beauty of the human form and the nobility of the human condition. At age 95, she continues to create, guided by those unshakeable ideals." Text from elizabethcatlett.net. Photo from LA Times. View her work here. "Sandra Rowe received her B.A. from Cal State University, Fresno and M.F.A. from UC Irvine in art with a focus in painting drawing and installation. She is a visual artist, writer, consultant, curator and educator. Rowe's work has been included in exhibitions in Japan, the United States, Paris, Cuba and Nigeria. She has received awards from the National Endowment for the Arts and Los Angeles Center for Contemporary Art. Rowe has also worked on numerous public art projects including Los Angeles County Metropolitan Transportation Authority's "Public Artwork for the Los Angeles Blue Line at San Pedro and Washington Streets" and the Anaheim Arena "Pond" project (artist team member for the interdisciplinary Public art project in the main entrance). Rowe was a lecturer for the Hatch-Billops Collection in New York. The collection is an archive for African American Artists from every creative discipline in the United States. A book is published yearly. She is a retired tenured faculty member from Cal Poly Pomona." Text and photo from artvulups.org. View her work here. "Julie Mehretu was born in 1970 in Addis Ababa, Ethiopia. Mehretu’s paintings and drawings refer to elements of mapping and architecture, achieving a calligraphic complexity that resembles turbulent atmospheres and dense social networks. Architectural renderings and aerial views of urban grids enter the work as fragments, losing their real-world specificity and challenging narrow geographic and cultural readings. The paintings’ wax-like surfaces—built up over weeks and months in thin translucent layers—have a luminous warmth and spatial depth Their formal qualities of light and space are made all the more complex by Mehretu’s delicate depictions of fire, explosions, and perspectives in both two and three dimensions. Her works engage the history of nonobjective art—from Constructivism to Futurism—posing contemporary questions about the relationship between utopian impulses and abstraction." Text from PBS. Photo from georgetown.edu. View her work here.